By this point, we have covered most of the main parts of the skate – the wheels, bearings, plates, and boots – but we haven’t talked about all of those little extras that make help make the skate complete. Roller skaters don’t need things like soakers and skate guards, but we do have lots of other accessories that help to fill up our skate bags. *Disclaimer* I want to state that all of my reviews are opinions formed based on personal experience and are not meant to be an ultimate guide or reflect negatively on any of the companies or products I am discussing. I am only offering my opinions in the hope that someone might find my comments useful or offer their own suggestions in the comment section. Everything I have tested I have borrowed or bought myself – no sponsorships or anything like that. Like buying a high-end sewing machine, skate equipment needs to feel right to a skater, and what I like might not be the best for someone else. However, I have been skating a long time on a lot of different equipment, so I feel like I do have something valid to contribute to the discussion. Toe stops are used by freestyle skaters for jumps and spins, and also during free dance and creative routines. Figure skaters and most compulsory dance skaters don’t use toe stops because they get in the way of close footwork. 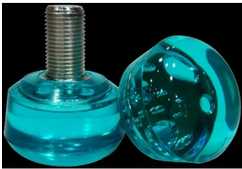 Some dance skaters use small rubber toe plugs or mini stoppers so they can still have a means of stopping, but other skaters don’t use anything other than their wheels to stop. Several companies sell toe stops, but as with much of the skate equipment today, Roll Line seems to dominate. 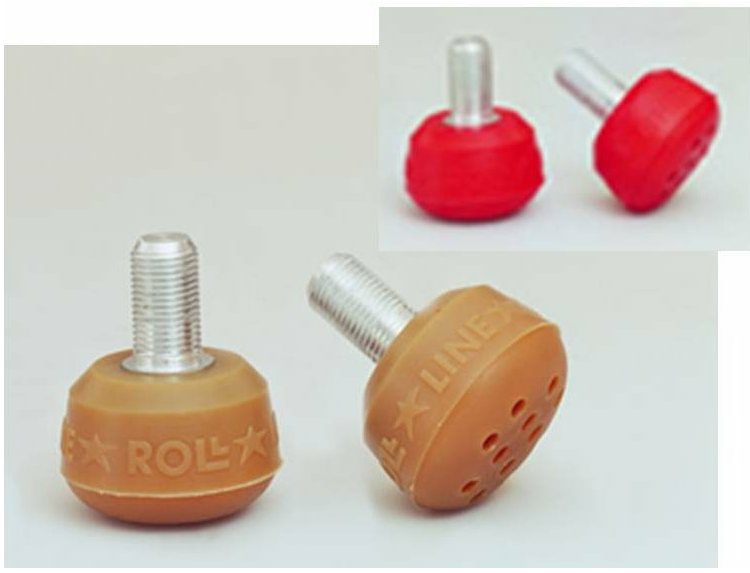 Roll Line: Roll Line offers toe stops with various levels of bounciness and in many different colors. 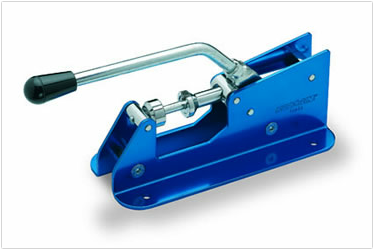 Nearly all skaters that I know use Roll Line toe stops, mainly because most skaters use the Roll Line plates. The freestyle skaters tend to go with the Super Pro Super Jump cappuccino toe stop, and the dance skaters tend to use the Super Professional Natural colored toe stops. They also offer smaller toe stops and plugs for dance skaters. Komplex: Komplex is now offering their own version of toe stops, but I don’t know anyone who is using them yet. They don’t have any dance plugs, but their prices are slightly lower than the Roll Line prices. Snyder: When I started skating, everyone used the grey Snyder toe stops. Some people still have and use them, but most everyone has gone to the Roll Line stops (even if they don’t have Roll Line plates) so I haven’t seen this in much use in recent years. STD: Another company where I haven’t seen anyone use them, mainly due to the fact that you can’t buy them in the US, but they offer some fun crystal clear toe stops in teal, purple, and clear, which might not be the best for competitive skaters, but certainly might be fun to have in general. Wheel spacers and dust covers are used to stabilize the wheels and bearings, and to add an extra layer of protection from dirt. There are two types of spacers – washer types that go on the axel to help push the wheel outward and cylindrical types that go in the wheel between the two bearings. The washer types can be bought from a hardware store, but I usually get either the Roll Line or Atlas brand cylindrical ones to put inside my wheels. It looks like Komplex may be offering some of their own soon as well. These are fairly cheap, and I find that they help to stabilize the centers of wheels with lightweight plastic hubs (like Grease and Komplex wheels) and keep the bearings spinning longer. I don’t tend to use them on more solid wheels like the Giotto figure wheels or Bones dance wheels, since these are sturdy enough to keep the bearings in place. I also like to use the Atlas dust covers, since I skate on some dusty floors, but I know a lot of skaters who don’t like using spacers of any kind because they feel it slows them down. 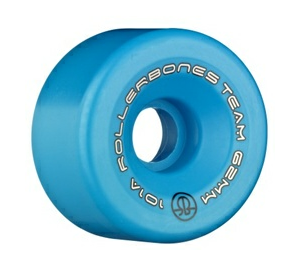 I would like to note that Roll Line recommends using the inside the wheel spacers on all of their skates. A bearing press might seem like a luxury, but once you start building up a collection of wheels and bearings (or when you want to clean them) it is an almost indispensable tool. Just make sure you get one that is fairly heavy-duty. I bought a cheap one for about $40, and when I was trying to press bearings into a Grease wheel it bent into an unusable state. After the incident I spent over double that on a Roll Line bearing press, and it has been fabulous. If you are going to get one, you might as well get a Roll Line. A splurge, but totally worth it. Boot covers are something I sew myself, and many people ask me why I use them. I like them because they protect the boot and they protect the tights. When you wear them under a pair of over-the-boot tights, you are far less likely to get holes from the eyelets. Also, if you have many pairs of skates in one bag, the boot covers add some protection to the boots themselves. I often have people ask me if I am breaking in new boots when I am putting on my five-year-old figure skates. The answer is no, they aren’t new, but yes I do take care of them by keeping them protected. The Backpack: The skate backpack is a pretty efficient method of transporting skates. Skate backpacks are offered by Transpack, Roll Line, and Snyder. The Transpacks tend to be the most affordable, and come in a wide variety of colors. The Roll Line ones seem to have more pockets though. Some people can fit two pairs of skates into these bags, but I usually just fit one and use the center to carry tools, extra wheels, and notebooks. 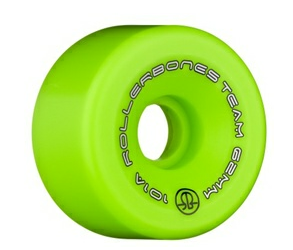 These can usually fit nicely into an overhead bin on a plane, and are easy to transport at skating competitions. They don’t take up as much space as other bags, and people tend to like to decorate them with their names and other designs in craft-paint. On the other hand, these bags tend to not last as long as other bags (the wheels tend to rip holes in them), and for kids who are coming to the rink with school backpacks, adding a skate backpack might not be the easiest option. The Duffle Bag: Many adult skaters seem to like the duffle bag. Spacious, cheap, easy to travel with and it comes in many different sizes. Most skaters can get 2 or 3 pairs of skates into a single bag, as well as all of their notes, socks, extra clothes and other stuff. However, these bags tend to fill up quickly and get very heavy. With a single strap the weight isn’t very evenly distributed, and so it can be annoying to carry for long distances. I do like to use a small duffle as a travel bag for airplanes, but then switch to my normal skate bag when I get to my destination. The Rolling Suitcase: Many roller skaters use a rolling suitcase as their skate bag of choice. 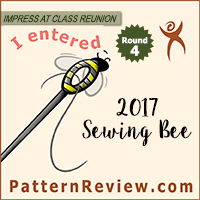 You can find them in many different sizes, colors, and designs, easy to pick up at a department store, and they often last very well. They are also great for holding multiple pairs of skates and are easy to transport. However, they can be more expensive than a backpack or duffle bag and might be too big to carry on to a plane. They often take up a lot of trunk space in the car, and unlike the softer duffle bags you can’t really squish them in to fit. They do, however offer a bit more protection for the skates than a softer duffle bag. 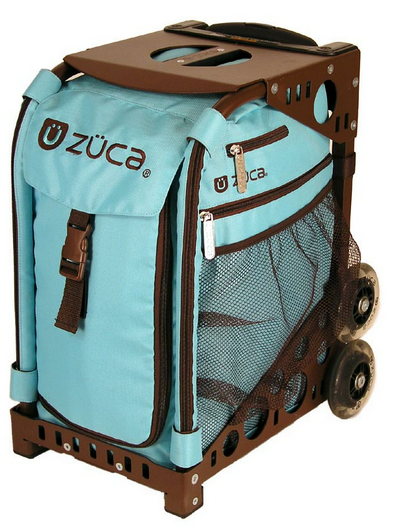 The Zuca: The Zuca bag is a trend that has been much more popular in ice than in roller skating. The bag is a heavy metal case with an interchangeable bag part, which makes it easy to keep the frame and replace the bag when it gets worn. 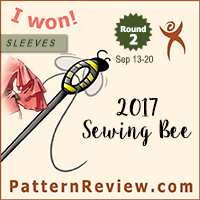 There are lots of pockets and lots of options for colors and designs. The top can even be used as a seat when you are waiting for the rink to open or for the bus to come. The bags are super heavy duty, and are supposed to fit in overhead bins on airplanes. However, these bags only comfortably fit one pair of skates for an average sized foot (adult males might not be able to fit their skates in this bag easily) and they take up a lot of space without providing a lot of space on the inside. They are very expensive and really really heavy. Personally I don’t think they would be functional for me as I have too many skates and I don’t want my bags to add too much unnecessary weight, but the people who have them seem to like them. Skaters tend to accumulate a lot of tools. In addition to the tools that came with their plates, most skaters tend to want extra allen wrenches in multiple sizes, adjustable end wrench, and a ratchet wrench with changeable sockets. Some people also have a lot of tools for mounting boots (I have someone else mount them for me) and cleaning bearings. Inside their bags, some skaters also tend to carry around extra toe stops, extra wheels, spare laces, spare parts, extra cushions, hair ties, extra tights, gloves, and tons of socks. They also like to have water and notebooks in their bags, as well as lightweight cover-ups if it is cold, and towels for if it is hot. First aid kits and body tape/bandages can be good to have as well. And scissors. Always have scissors in your skate bag. Always. So… accessorizing can be fun, no? Just as with sewing, the longer you skate, the more small random tools you will acquire and find uses for. Or things that are impractical but that you just want to have. So my skating readers – what accessories do you like to have, and what can you live without? 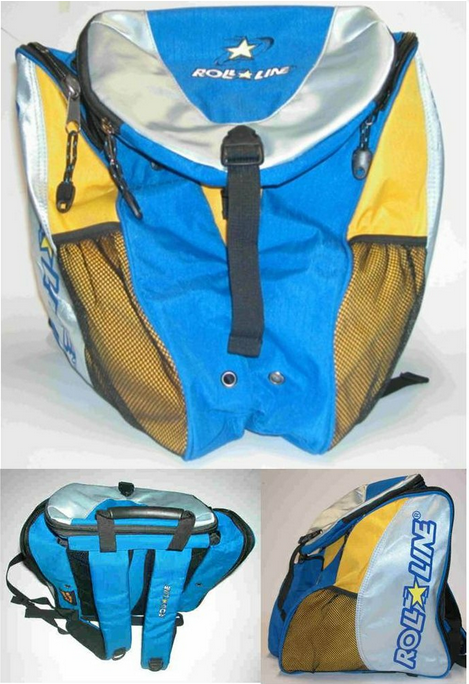 What sort of skate bag do you like? What do you carry in it? Have you ever bought accessories that weren’t exactly practical, but just because you wanted them? Discuss! My friend uses komplex toestops and finds them good 🙂 I'm on rolline natural coloured toestops myself. Also suregrip dance plugs seem to be going round a bit in NZ at the moment, perhaps because they have the novelty of all the prety colours. Where can I find the roll line back pack?